Everyone has certain foods that come to mind when you think of Thanksgiving. Turkey and mashed potatoes are probably the obvious ones that most people think of, but some of you might think of your grandmothers green bean casserole, or mom's special pumpkin pie. For me it Jello. No, not exactly your normal Thanksgiving fare but this is not normal Jello. We would eat this Jello only once a year growing up. 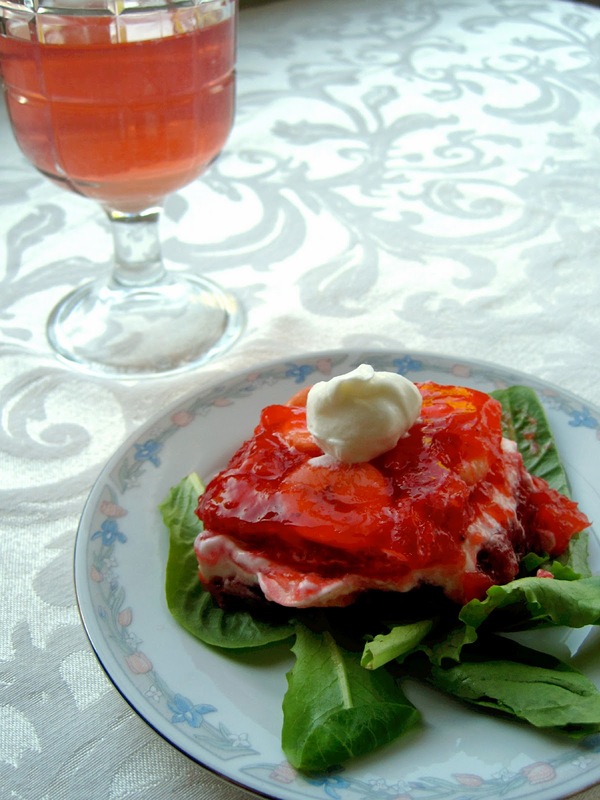 On Thanksgiving my mom would pull out her nice china and she would set a small salad plate with served with a perfect square of jello on a lettuce leaf. It was Jello, but in my mind it was perfectly elegant. The recipe I got from my Mom was written on a 3X5 card probably given to her from a friend. I didn't know the origins of the recipe until I picked up a 1965 edition of the Better Homes and Gardens New Cookbook at a garage sale. In their salad section I saw the recipe for Strawberry Cream Squares it was the same one my Mom had been using all these years. The first time I made this on my own I didn't pay attention to the part that says sliced strawberries and I got large whole ones. Let's just say it made it difficult to eat. Don't make the same mistake I did. Dissolve gelatin in 2 cups boiling water. Add frozen strawberries; stir occasionally until thawed. Add crushed pineapple and bananas, finely diced. Pour half into 8x8x2 inch pan. Chill until firm. Spread evenly with sour cream. Pour remaining gelatin on top. Chill into firm. Cut into squares. Serve with a dollop of sour cream if desired. again and page 14 was missing. Thank you for sharing the recipe; now we have it again.